The organization posted a list of significant “Chicano movement” activists on its website which included Sijisfredo Aviles. Dec 6 1969 Chicano anti Vietnam War Conference at Crusade for Justice, LA activists Ramses Noriega, Bob Elias, Javier Galvez (Claremont Colleges Mecha) myself, and Chicago Puertoriqueno activist Sijisfredo Aviles. We began planning with Corky Gonzales and the Crusade, Bay Area Chicanos, as well as from Texas, New Mexico, maybe Arizona. — with Ramses Noriega and Sijisfredo Aviles. 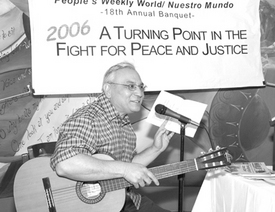 The Chicago Communist Party USA 22nd Annual People’s World Banquet Dec. 6 2009 at the Parthenon Restaurant. Several thousand dollars was raised for the PW Fund Drive from "supporters who dug deep despite the hard economic times". The program included a performance of Mescolanza, a new performance group of movement veterans Terry Davis, James Thindwa, Sijisfredo Aviles and Bob Huston who "hope to carry multi-cultural social justice song to the picket line, rallies and events". Tim Yeager with his accordion joined them at the end for Solidarity Forever and the International.